Real estate assistant jobs are on the long list of administrative jobs you can easily do from home. Surprised? Don’t be! Thanks to technology, most admin tasks can be done remotely. This includes traditional in-office activities like calendar management, supplies ordering, and even faxing! So, this means you can be sitting in your living room or home office while helping others from all over the country (or world). One such profession that often benefits from virtual assistants are realtors. And, if you’ve ever thought about becoming a realtor or want to work from home helping others, this might pique your interest. What does a real estate assistant even do? Do I have to have experience to get started? What about a passion for real estate — is that a must? How much can I actually earn? Where can I even find work? These are all great questions, and ones I’ll answer as you work to figure out if real estate assistant jobs are the right path for you. What Does A Real Estate Assistant Do? Of course, the specific tasks a real estate assistant undertakes depends on the realtor they’re working with. It also depends on whether or not you attain licensing. Remember, you DO NOT need a license to pursue real estate assistant jobs. That’s because you can still perform many important admin tasks as an unlicensed real estate assistant that even include listing properties and assisting with closings. Do I Need Experience To Get Hired? Sound like you? Woohoo! You’ve got the basic building blocks needed to be a successful real estate assistant. Should I Have A Passion For Real Estate? This isn’t such a cut and dry answer. Of course, it’s a huge bonus if you do have a passion for real estate. Any time you enjoy what you’re doing, the greater your job satisfaction. But that doesn’t necessarily mean you’re out of luck if you don’t live and breathe real estate. Being indifferent about buying and selling properties is okay. As long as you genuinely enjoy helping others grow their business, you’ll be just fine. And, who knows, maybe you’ll jump in and realize the passion for real estate was actually there all along! What Can I Expect To Earn As A Real Estate Assistant? Generally speaking, real estate assistant jobs pay more when you’re self-employed versus working in an office setting for a broker or firm. This is often because you get to work for multiple clients and set your own pay rate. Where Can I Actually Find Real Estate Assistant Jobs? You can also check large job search sites, like Indeed or ZipRecruiter. There are also niche job boards that focus specifically on real estate job leads. A popular one is called Select Leaders. Remember, the jobs posted here are likely local and employee positions. That means you’ll be expected to go into the office and will earn a predetermined hourly wage for your work. If you want something more flexible (who doesn’t?) that allows you to work when you want AND from the convenience of your home, then you’re going to want to strike out on your own. I’m a firm believer that anyone can launch and scale a successful service-based business. As a reminder, a service-based business is often called freelancing. When you freelance, you are your own boss. Yes, you work for clients but at the end of the day, you run the show and determine how you’ll work, when, and for whom. And, it just so happens that real estate assistant jobs lend themselves really well to freelancing. That’s because there are a TON of realtors out there who could benefit from a helping hand every now and again. They don’t necessarily need a full-time, in-office assistant. Instead, they need someone from time to time to help them with the tasks they’re too busy to do. That’s where you can come in as a virtual real estate assistant. How Do I Become A Virtual Real Estate Assistant? It’s one thing to decide to launch your own service-based business as a real estate assistant. It’s a whole other ball game actually getting started. The good news is, you can test the waters and try your hand at freelancing pretty quickly if you’re unsure if it’s right for you. There are a number of freelance service sites, like Upwork, that allow you to sign up for free and start pitching your services to clients. A quick search on Upwork for real estate jobs yields dozens and dozens of results. Job opportunities range from cold callers for real estate agents to property listing writers and, of course, real estate assistant jobs. Keep in mind, you typically can’t earn as much when you use freelance sites. That’s because the marketplace site charges you, the freelancer, a percentage of your earnings. It can be a good way to test the waters as a new freelancer, but it can really start to eat into your profits when you’re constantly pitching to job ads and competing with tons of other freelancers. A better way to go about freelancing as a virtual real estate assistant is to strike out on your own. The good news is, if you feel ready to jump all in and find real estate assistant jobs on your own, you don’t have to go it alone. 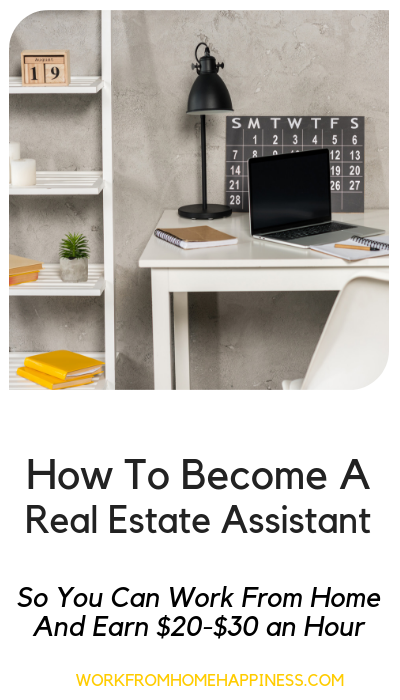 Over at Horkey Handbook, there’s a self-paced, fully online course to help you jumpstart a real estate assistant biz, even if you have zero experience. The best part? You have lifetime access to the course and materials. That means you can continue to learn and grow for as long as you choose. And, since the going rate for a virtual real estate assistant is $20-$30 an hour, you can earn your investment back in just a few short hours. Head on over to the Real Estate Assistant Course at Horkey Handbook to learn more and get started today. You’ve got this! There you have it — how to find real estate assistant jobs, even if you’re just starting out. Remember, there is no right or wrong way to get started. You just have to actually get going. As always, if you have any questions let me know if the comments below. You’ve got this! P.S. This post contains affiliate links. Check out my disclosure statement for more information.